Its time for another RPG Breakfast Club! 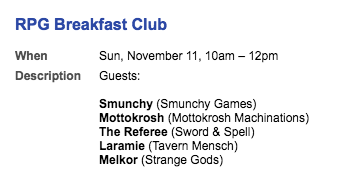 We have a great line up tomorrow, with Smunchy, Mottokrosh, The Referee, Laramie and Melkor. I think it should be noted that this is not an open audio forum. All users not on the guest list are silenced. I have no interest in this format and will not be participating.